With Panoramas, you can navigate unfamiliar areas in several hundred cities by looking at the intersections and road signs or local landmarks. You can, for example, check out the area around a particular building you might move into or show your friends an interesting-looking place and print photos of it. In addition to street panoramas, you can also see panoramas of organizations on Yandex.Maps. To enable “Panoramas”, click Panoramas on the map. Click on a point on the blue line or select an item on the map. Then click View on panorama in the place card that opens to view the panorama with the street names and building numbers. Under the street panorama, you'll see a rectangular map of the surrounding area. This map displays the network of streets that include panoramic photos. Your current panorama location is marked with a circle and viewing direction. To zoom in, click : To zoom out again, click . “ Go ” in the correct direction. 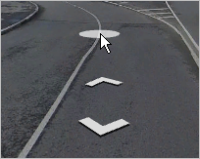 To move in a street panorama, click on a white arrow that indicates a direction or on a white oval that marks an area you can view. Change the scale of a photo. To zoom in, scroll the mouse up or click . To zoom out, scroll the mouse down or click . Drag the panorama image using the mouse. Click on the appropriate arrow (left, right, up, or down). “ Jump to a new location ” in the area surrounding your current point. Just move your cursor over to the thumbnail map in the lower-right corner of the screen and click on a location along one of the blue lines. The screen will display the street panorama for the point you select. Share a street panorama by clicking . Print panorama by clicking . See the full address for the building shown on the street panorama. Just hover the cursor over the address icon (it will change colors). Then click on it. To close Panoramas, click Close in the upper-right corner of the page.